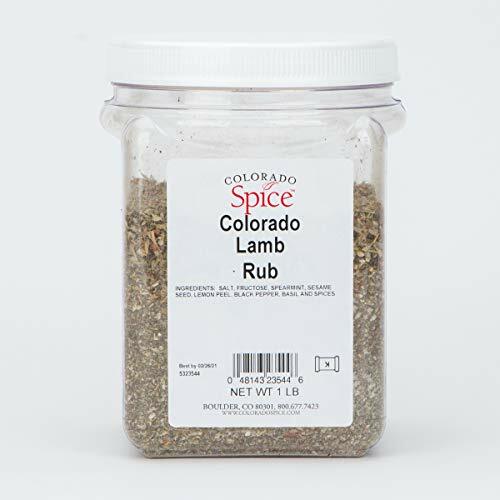 A “Rub” is a catch-all phrase for any spice mixture we rub onto meat before we grill or smoke, to enhance the flavor. There are an infinite variety of flavor possibilities. When you think of all the herbs and spices in the world, they’re like colors on an artist’s palette. You can mix endless combinations to get the colors, aromas, and flavors you desire. Experimenting with those infinite flavor possibilities to make your own rubs is fine, as long as you have the time and resources to dedicate towards your search for the world’s greatest rub. For most of us, we just want a good tasty rub that we can buy now so we can get to grilling. To save you time, I’ve searched forums and many websites to find what people liked and used as the best BBQ rubs you can buy online. Then I broke them down into categories to help you choose the rub you need for your next cook out. Below are the categories of rubs you will find in this guide. There are three selections in each category and five best specialty rubs. We all have our favorite herbs or spice, right? For your reference and comparison, I’ve included the ingredients for each one. I’ve removed the above ingredients from the lists to make it easier for you to compare the different ingredients for each rub. If you need to see the complete ingredient list, please follow the links that I’ve provided in the article. Salt can be a major ingredient in commercial rubs. It’s cheap and heavy, so some big manufacturers use it to reduce costs, not to enhance flavor. Be careful with rubs that are mostly salt such as seasoning salt. A quality rub uses salt and sugar sparingly to enhance the flavor of the other ingredients and not just to add weight. Also, keep in mind that sugar burns at 375°F (190 °C) so if you plan on grilling meat or chicken for extended periods of time at or over that temperature, a rub with lots of sugar will burn and turn bitter. This is important to be aware of if you plan on finish searing any meat, like chicken, on the high side of your grill. How do you get the rub to stick to the meat? Some people let the moisture from the meat hold the rub in place, rehydrating the ingredients. Others use “glue” like olive oil or some yellow mustard. Experiment to see which method works best for you, and be sure to check out our guide to using dry rubs correctly, including when to apply, how muc to apply and more. Whereas a particular rub that’s formulated to enhance beef, may ruin a good chicken – and vice versa – these rubs are good for all meats and should be a stock in everybody’s cupboard, for those ‘just in case’ times when you run out of specialty rubs. They hand make this rub in micro-batches. Because it is more on the sweeter side, it is better with pork or chicken than red meats such as beef or lamb. It contains a secret blend of twelve different herbs and spices to create their unique flavor. Besides amazing flavor, it gives excellent color to your meat. If you love sweet, savory with a touch of heat, this rub is perfect for you. It works well either on the smoker or grill with any cut of chicken, skin on or skinless. 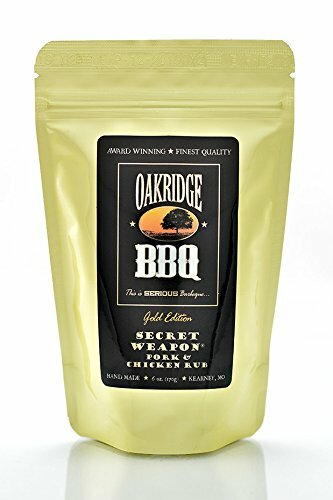 This rub tastes great on chops and wings as well. Other Ingredients: Chilies (including paprika, ancho, chipotle & guajillo), ginger, coriander, turmeric, mustard, celery, shallots and other exotic herbs and spices. 100% all natural with no MSG, no fillers, no artificial colors, flavors or additives. This rub won the 2009 American Royal Invitational BBQ competition, so you know it’s one of the best bbq rubs out there! You will note that it has fewer ingredients and less sugar than the Secret Weapon Pork & Chicken Rub above. Sometimes, simpler is better. It does have quite a bit of salt so be careful not to add extra salt. It is an exceptional all-around BBQ rub. 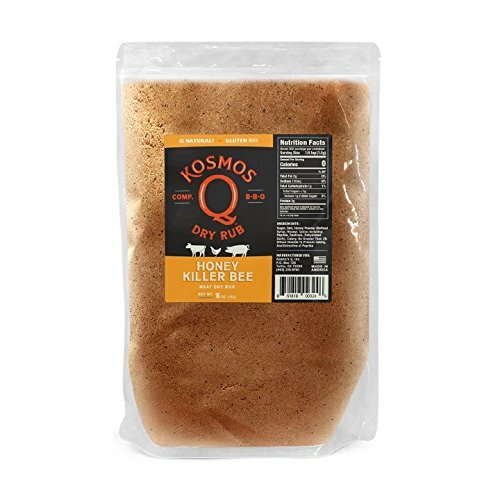 Consider this rub if you’re participating in a barbecue competition of if you’re a backyard chef. The sweet and spicy flavor will wow you. Other Ingredients: Chili pepper, celery powder, mustard flour, disodium inosinate and guanylate, not more than 2% calcium stearate added to prevent caking. Gluten free, no MSG. This rub not only has a memorable name, but it also has the most reviews of all the barbecue seasonings. It works well seasoning poultry, and it’s a good “base” to which you can adjust your heat and sweetness. You can also dash this rub on vegetables cooked either in water or steamed for more flavor. It has a nice chipotle kick if you like a little bit of heat. Other Ingredients: Chipotle (smoked jalapeno). It is gluten free, no sugar and no msg. It is nearly impossible to narrow the list down to only three pork rubs. There are hundreds (thousands?) of them. What I did was to find the brands with the most buzz in forums and reviews online. It’s a popularity contest after all. This rib rub has its origins from a family recipe out of Raleigh, North Carolina. Today, they export the rub and sauce by the same name to over 80 countries. It’s that good! It’s not too spicy for those who can’t stand too much heat, but it is full of flavor. This product is reasonably priced. Besides pork and ribs, it is also good for steak and veggies. Other Ingredients: Chili pepper, bell pepper, mustard flour, celery powder, citric acid & natural flavor. No MSG, artificial ingredients and is gluten free. There were many glowing compliments for this rub in smoking meat forums, so I couldn’t resist including it here. 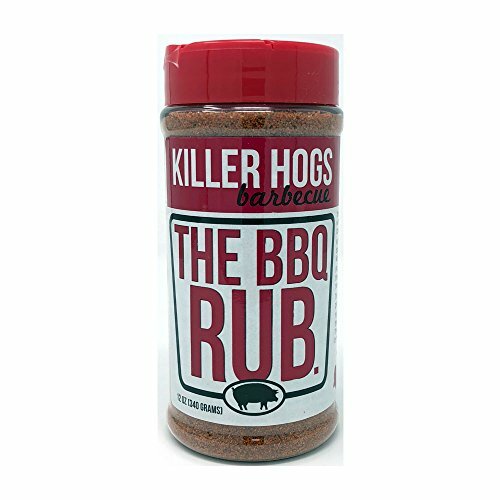 The rub is perfect for pork shoulders, ribs or any cut of pork. The reviews did state that it was not “strong” enough for meat or game, which is OK since we’re only interested in a good pork rub anyway. It’s not overly spicy. 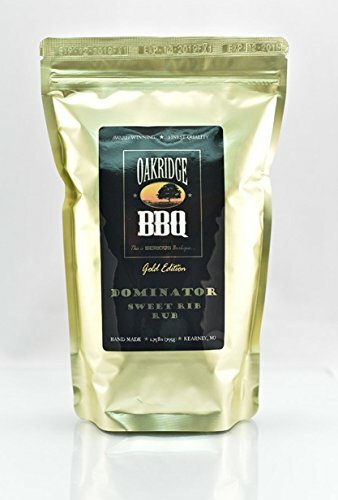 It is sweet with a hickory smoke flavor that enhances any cut of pork you rub it with. If you love pork but are not too crazy about the blazing hot spice, this rub is for you. Other Ingredients: Spices, Disodium inosinate and disodium guanylate, natural hickory smoke flavor. Contains no allergen. The BBQ Rub was born from two competition winning brothers, Malcom and Waylon Reed. These gentlemen have won many competitions over the years. The rub they use is available online and called “The BBQ Rub.” The name is uninspired, but the flavor isn’t. This rub has received rave reviews from hundreds of backyard cooks and pros alike. You can watch Malcom Reed use THE BBQ Rub on Memphis style ribs here. This rub will help your pork get a nice mahogany bark with natural flavors and mild heat. Other Ingredients: Spices including chili pepper, evaporated cane juice, orange peel, monosodium glutamate, mustard flour, dill weed, turmeric (color), and natural flavor. Typically, you won’t find much sugar in the best bbq rubs for beef. In fact purists say you should only use salt and pepper, “Dalmatian rub,” on beef. Those two are the primary ingredients for most beef rubs along with other traditional flavorings like garlic, onion, and paprika. These are three quality rubs that work well for any beef you’re cooking. If you’ve ever eaten grilled beef between Texas and California, it’s probably a sirloin cut known as Tri-tip. It’s not a cut you usually find in the east or north, but it’s coming. And when you grill this fatty little chunk of beefy goodness, you want to rub on Santa Maria Grill Seasoning. Santa Maria style beef barbecue has its roots in California with a Mexican flair. The rub is a basic salt, pepper, onion, garlic mix with a touch of heat to keep things interesting. It’s great on steak or brisket too. For those who crave the rich garlic flavors, pepper and spicy chilies on their brisket or grilled steak, this is perfect for you. Other Ingredients: Chilis (including paprika & chipotle), parsley and other spices. It is all natural with no MSG, fillers, artificial colors, flavors or additives. This is an essential Texas style rub with the ingredients in all the right proportions, and why it’s so good. It enhances the flavor of beef without being too assertive. It’s a little sweet and mild so kids can enjoy your brisket too. If you’re a fan of Texas Barbecue, this is the rub for you. Other Ingredients: Spices, parsley, hydrolyzed corn protein, disodium inosinate, disodium guanylate and less than 2% silicon dioxide for anti-caking. No gluten, peanuts or tree nuts. John Henry Abercrombie has been barbecuing his entire life in East Texas. Of all the spice blends his company makes, this is one of the best sellers. It tends to be on the sweet side as rubs go and the spice is mild so everyone can enjoy it. It is a salt base rub so use wisely. 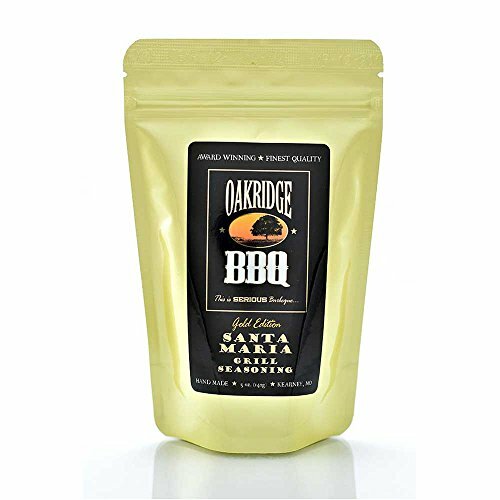 This Texas brisket rub has a nice natural smoke flavor that is also great for pork chops and chicken. Other Ingredients: Natural smoke flavor, lemon oil and 1% sodium aluminosilicate to prevent caking. Let’s face it, they’ve been grilling lamb in the Middle East, from North Africa, and into Turkey, for a long time and know how to make rubs that complement the meat. Za’Atar is the name for the blend of spices and seasonings used to season lamb for grilling. 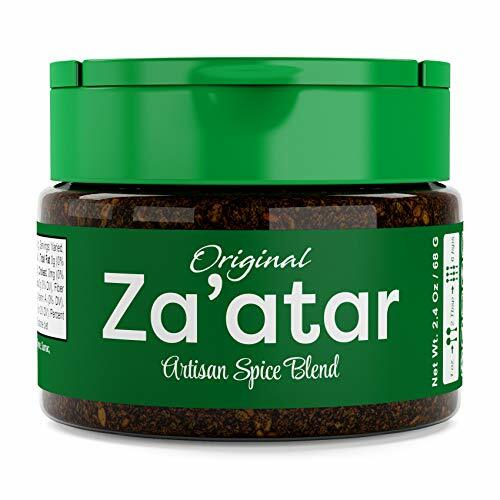 You may also find it spelled Zatar, Zaatar or Zahtar. The flavors in this Za’Atar are original and unique. It’s like no barbecue rub you’ve tasted. USimplySeason blends the distinct flavor of sesame seeds with the herbal trilogy of oregano, thyme, and marjoram before finishing with the tartness of red sumac. There is no salt in this spice blend. For those on a Paleo Diet or Mediterranean diet, this seasoning is a great fit for both. It contains healthy ingredients without sugar or salt. Other Ingredients: Roasted sesame seeds, thyme, sumac, oregano, marjoram. No MSG, no salt, no GMO, and vegan approved. Savory Spice adds salt and cumin to their blend giving added flavor and aroma reminiscent of a good curry dish. It can be used as a stand-alone condiment too. Easy on the rub or seasoning because it can be a little salty. The aroma and taste of your lamb seasoned with this will remind you of the middle eastern/Med-Rim restaurant dishes. Other Ingredients in this best bbq rub for lamb: Sumac berries, toasted sesame seeds, cumin, Mediterranean thyme, Greek oregano, and marjoram. Sugar-free, gluten-free, vegan and MSG-free. This Colorado rub has lemon peel, basil, and spearmint, which makes you think of Greece more than New Zealand. They add salt, fructose, and black pepper to balance this spice blend. Lamb and mint have always been a classic combination, and this rub adds spearmint for that wonderful flavor. Lamb is expensive, and you don’t want to ruin it with the wrong spice mix. New Zealand Lamb Rub is blended specifically for lamb. Other Ingredients: Fructose, spearmint, sesame seeds, lemon peel, basil, and spices. Kosher certified, contains no dyes, artificial colors or MSG. The beauty of grilling chicken is it’s so versatile. It easily absorbs any flavorings and spices you want. That’s why there are so many options when it comes to chicken rubs. Like pork, chicken goes well with sweet, savory or both. Chicken becomes the delivery vehicle for your favorite rub or sauce. I think you’ll agree that these three chicken rubs are consistently good no matter how you cook your bird. In fact, these seasonings work well on any poultry from quail to turkeys. 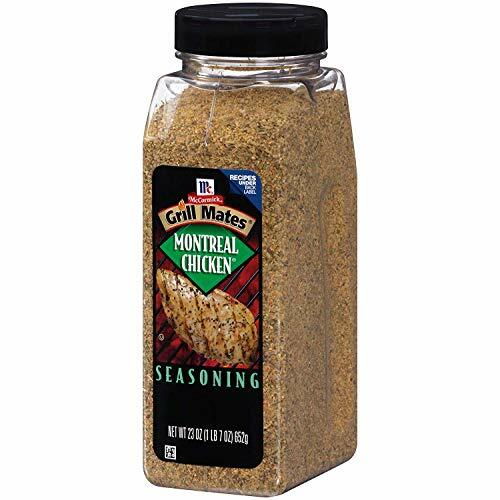 You’ve probably heard of McCormick’s Steak Seasoning, but they make a delicious chicken spice seasoning rub too. You’ll find it in most chicken restaurants and barbecue pantries. You do have to watch how much you use because it can be a little salty. It is a mild blend, so you need to add some cayenne or chipotle powder if you want to kick up the heat. This seasoning is made with natural spices and herbs. This is one blend you should always have in your kitchen. Other Ingredients: Spices (including black pepper, parsley, and red pepper), orange peel, green bell peppers, and sulfating agents. No MSG, artificial flavor or colors added to this product. This unique rub adds a touch of honey for sweetness that works well on chicken. It won a 2015 World Steak Champion, so you know it works well on other meat too. The rub has a savory sweet flavor, with a touch of honey. Small ground spices make it perfect for injecting. Other Ingredients: Honey powder (refined syrup honey), dextrose, celery, no greater than 2% silicon dioxide to prevent caking and spice. No MSG and gluten free. 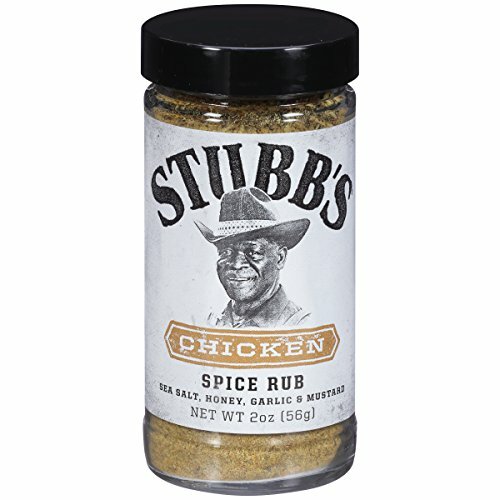 Stubbs Chicken Spice Rub has a balance of sweet and savory between the honey and mustard flavors that’s hard to find in other commercial rubs. The rub enhances the flavor of the skin and the meat underneath it. It has the smoke flavor with earthy, herby taste which is good for skinless breasts that don’t spend much time on the grill. The rub caramelizes nicely on the chicken. Other Ingredients: Honey powder, spices, mustard seed, dried red bell pepper, ground turmeric, celery powder and natural smoke flavor. All natural and gluten free. People often look for specialty spices, dried herbs, and seasoning blends because they are different. We get tired of the same old seasoning and look for something new. Specialty rubs contain unusual ingredients or combinations that you don’t typically find at a local store such as Jamaican jerk seasoning. Specialty rubs have unique flavors that make your grilling experience one to remember. No best bbq rub guide would be complete without a jerk seasoning! Spice Islands say that this seasoning is the “#1 seller in Jamaica and the Caribbean with its distinctive spicy flavor.” That is quite a testimonial considering the Caribbean Islands are famous for jerked chicken and pork. This is an authentic version, so there is plenty of heat from the red pepper and ginger. You can mix it with lime juice for a wet seafood marinade or with mustard for a thick spicy coating for pork. This spice mix is an explosion of flavor. Other Ingredients: Jamaican pimento, ginger, celery, mustard, crushed pepper. This classic spice mix, once relegated to just seasoning crab and shrimp, has become a secret ingredient and a rub all its own. The first flavor is celery seed with a generous amount of salt, black and red peppers. However, the addition of 18 other herbs and spices make it hard to recreate. 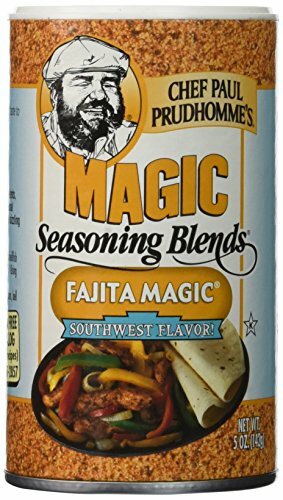 One of the most versatile seasoning blends on the market. The paprika gives the hint of smokiness and spiciness without being overbearing. 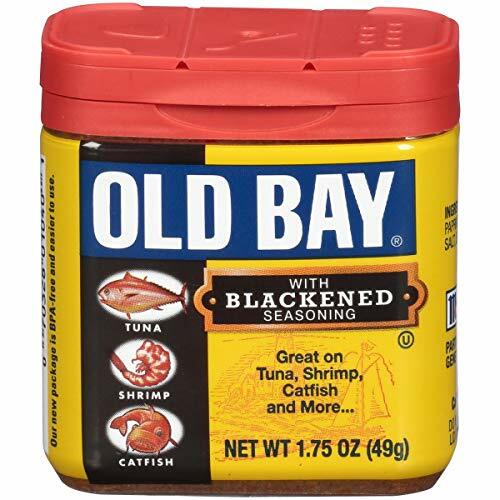 Old Bay is a staple spice in kitchens from Maine to the Gulf shores of Texas. Other Ingredients: Celery salt, (Salt, Celery seeds), spices (including red pepper and black pepper) and paprika. For smoking briskets, putting coffee in a barbecue rub seems like a novelty. However, the coffee flavor tends to soften the sweetness of any mopping sauces or other sugar based rubs you apply. I chose Trader Joe’s version because it is time-tested and has good reviews in several barbecue forums. One unusual ingredient is the use of Clemengold rind. It comes from the Nadorcott mandarin oranges from Morroco and South Africa instead of Florida juice oranges. 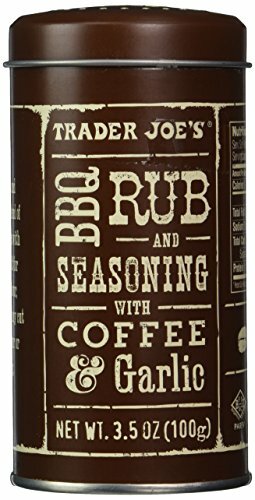 If you want to give a coffee rub a try, this rub balances spicy, smoky, salty, and sweet flavor for any smoked or grilled meat. It is great as a seasoning or a dry rub. Other Ingredients: Coffee, red bell pepper, clemengold rind, paprika oil (color). Team Oak Ridge (Patrick & Kathy Phillips Banks) won $4,000 at the Memphis in May World Rib Championship. Another competitor, “Qbert60,” announced in the bbq-brethren forum that he placed 2nd out of 25. Both teams used Dominator Sweet Rib Rub. If professional BBQ judges vote for it, we think you’ll have great success with this rub too. This evenly balanced flavor rub is more on the sweeter side with a touch of cinnamon. Other Ingredients: Granulated honey, chilies (including ancho, guajillo, serrano & chipotle), coriander, Vietnamese cinnamon, yellow mustard, lime juice solids, other spices, and maltodextrin. It’s 100% natural, no fillers, allergen and anti-caking. Chef Paul Prudhomme has been an icon in the cooking industry who has been producing his brand of spice mixes for decades. Fajita seasoning is unique among rubs because of the citrus flavors of lemon and lime. This rub brings out the flavor of grilled beef and chicken. Chef Paul adds cilantro plus 15 herbs and spices for a truly authentic southwest flavor. You can use it as a rub or as a seasoning to replace plain old salt and pepper. It is mild, so you don’t have to worry about heat if that is a concern. Other ingredients: Chilies, spices, natural lime and lemon flavors, cilantro, tricalcium phosphate (anti-caking agent). It is Kosher and Halal, has no MSG or preservatives. I hope this list helps you discover the right rubs for your particular taste. Each one has unique flavor characteristics even though sharing some of the common ingredients. Taste a tiny bit of the rub by itself before you use it. That way you have a good idea of how sweet, salty or spicy it is before you decide to add other ingredients or mop with a sauce at the end. Did I miss any of your favorite rubs? Let me know what you think and which one is your preferred rub or seasoning. Hi Mark! Thanks for putting together this great list of BBQ dry rubs – very helpful! I’m curious to know if you’ve tried all of these yourself, and which one is your personal favorite for baby back ribs? I’ve not tried all of the rubs in this article, but have tried many. This article was written by a member of the content team and edited by myself, pulling info from many sources to list what are widely seen as the best rubs on the market according to customers, forum posts, other reviews and more, to put forward a sort of ‘internet hive mind’ list of the best rubs available according to many sources. Personally, I do have ‘Bone Sucking Sauce Rib Rub’ in my collection and can whole heartedly recommend this.